Sometimes a client doesn’t need fixing; they need the world to know about their product. When Maxim came to us with the desire to promote their product, their business-to-business sales, and their technology that keeps operating rooms running, and you healthy—we were ready. Maxim wasn’t looking to revolutionize the industry, they came to us with a solid product, reliable technology, and the honest need to increase their business. We specialize in building brands, and we know how to accelerate them into the limelight. 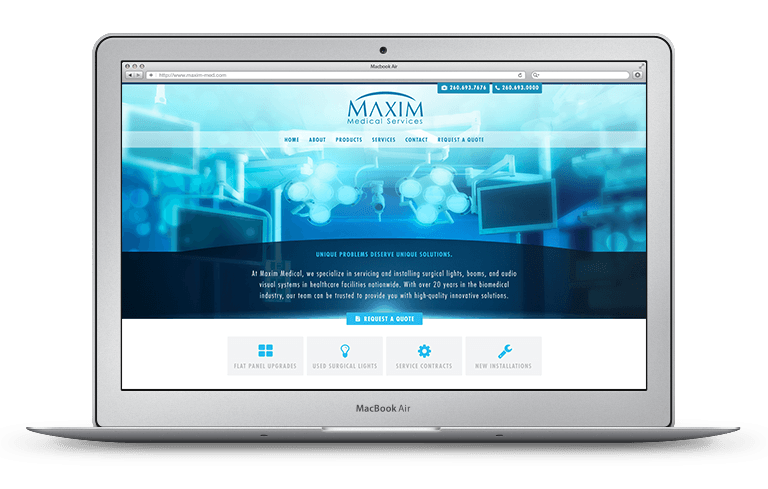 Maxim needed business-to-business promotion, and marketing for their top-notch technologies. To connect with their target market we knew it’d take more than just a web presence, beyond their custom website we established a strong logo, branding to set them apart from the medical appliance industry, and vehicle wraps to continue promotion and aid with word of mouth marketing. "Here at Redhype it’s about solving the client’s problem, and Maxim didn’t need a PR push or special events, they needed good, honest marketing, marketing that made them stand out, that showcased the essential nature of their product, a product that makes hospitals, our surgeries, and lives a little safer."